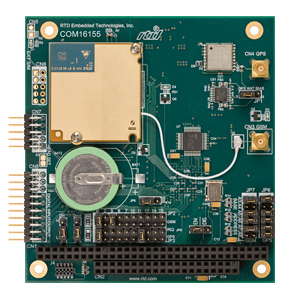 The COM16155RER combines a wireless tri-band modem unit and a low-power GPS receiver on one PC/104 module This board is built around the Triorail Module, a professional high-end module for GSM-Rail. The GSM-R radio system is designed to meet the needs of modern digital radio systems for railways in Europe and Asia. GSM-R is a communication standard for railway applications. Operating along the rail network and in stations, the system ensures a more secure and smooth flow of train traffic. GSM/GPRS connectivity is achieved using the Triorail engine. This unit works in the 900 or 1800 MHz and GSM-R band and supports standard network and service provider personalization. This module utilizes the Linx RXM-GNSS-TM GPS receiver. The receiver has very low power consumption and supports NMEA-0183 protocol. Support for +3.3V and +5V active antennas is provided. The COM16155RER board includes two complete 16C550 compatible serial ports that can be configured with jumpers for any standard COM port address or any free address space. A SIM card is located on the bottom of the COM16155RER-1 module. The COM16055RER-2 module provides an external SIM card reader connected via a standard 10-pin 150mm long flat cable. The ambient temperature of the COM16155RER can be monitored using an on-board temperature sensor. 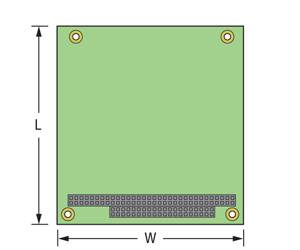 This sensor will use status bits to indicate that the module is within -20°C to +70°C temperature range where the GSM engine is guaranteed to work reliably and will assist in the restricted operation range of -40°C to +70°C.